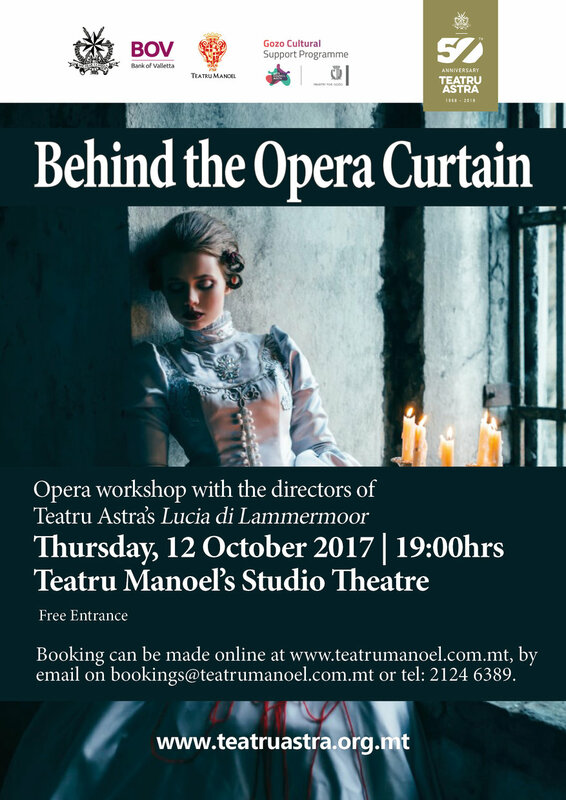 Teatru Astra has just announced its latest educational initiative, 'Behind the Opera Curtain', a free workshop featuring the artistic and music directors from Teatru Astra's forthcoming production of Lucia di Lammermoor. Aimed at opera lovers and patrons of the Astra residing in Malta, singers and students, the workshop will be held at the Teatru Manoel's Studio Theatre on Thursday 12 October 2017 at 19.00hrs. Artistic Director, Enrico Stinchelli, the Musical Director, Joseph Vella and chorus leader Maria Frendo will be sharing their insights on the forthcoming production. Lucia di Lamermoor is making a very welcome and much awaited for return to the Teatru Astra boards after almost 30 years. One of the flagships of the bel canto golden age, Lucia has enthralled and enraptured audiences since its premiere at Naples' Teatro San Carlo in 1835. Enjoying almost cult status, especially following the magisterial interpretation of Maria Callas at the Metropolitan and elsewhere, Lucia, the emotionally fragile ill-fated lover, towers among the peaks of Italian melodrama, and not only. At the height of his fame, dubbed the "sole reigning genius of Italian opera" following the demise of Rossini and Bellini, Donizetti proves the point in the most eloquent manner possible with his immortal Lucia. The opera is part of the 16th edition of Festival Mediterranea, a unique endeavour and the only festival of its kind on the Maltese islands, combining high culture with the production of an Italian opera in conjunction with traditional fare. The website www.teatruastra.org.mtÂ includes online booking facilities for the opera and carries all the latest updates on the opera and festival. The opera AIDA is supported by the Gozo Cultural Support Programme. Teatru Manoel has also a long tradition of staging operas albeit on a different scale to the Astra. Being a 1731 theatre with a stage that is merely 7 by 11 meters and an orchestra pit that is a miniscule 7 by three meters, the type of opera that is staged in this historical and artistic gem is radically different to the type of opera houses built in the Verdian tradition. In recent years the Manoel has presented Purcell's poignantly beautiful miniature opera Dido and Aeneas and Offenbach's Orpheus in the Underworld and Gilbert and Sullivan's Patience, all joint ventures between Valletta 2018 Foundation and the theatre involving Teatru Manoel Youth Opera. The last major opera productions, which are usually presented in March, have been Mozart's 'Clemenza di Tito', Donizetti's 'L'Elisir d'Amore' and Gluck's, 'Orphee et Eurydice'. Last year Teatru Manoel presented the first of the Mozart/Da Ponti operas "Le Nozze di Figaro". In March 2018 it will present "Don Giovanni" and in 2019 "Cosi Fan Tutte". To book and for more information on the opera and the workshop go to www.teatrumanoel.com.mt.